The US had learnt from WW2, that Airborne Divisions need the ability to tackle armoured vehicles, as they are dropped into and behind enemy lines. Tanks of the 1950’s proved to large and heavy to be deployed by airdrop with the Airborne Divisions. So a requirement was issued for an air deployable vehicle with enough punch to take on enemy armour. The US M50 Ontos Tank Destroyer was developed for this requirement, but the Airborne division went with the M56 and the US Marine Corp went with the M50 in 1955. Nicknamed the Ontos, which is Greek for ‘thing’ it was certainly not a conventional design, hence its nickname. The vehicle uses a remarkable 6 guns, rather than the traditional 1. Each gun is a 106mm recoilless rifle (fires round that is not practical to fire from a recoiling rifle, such as a standard tank gun) which fired a HEAT round. Modern Fire Control Systems were not invented during the vehicles introduction (wind sensors and ranging laser designators) so crews of the time relied on a high calibre machine gun firing a tracer round, which was shot first to gage the range of the enemy target. An M8C was fitted on the tops of the upper M40A1 recoiling rifles for this role. 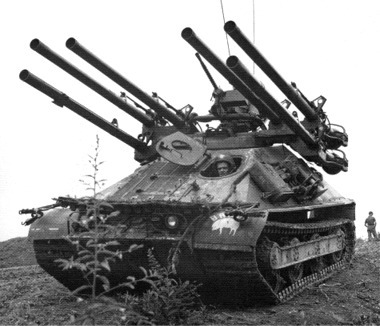 A total of 18 rounds (includes 1 up the spout of each M40A1) were carried in the vehicle. Thou the vehicle offered a greater level of protection than the M56 for the 3 man crew, the gunner was exposed to enemy fire whilst reloading each of the M40A1 tube as he would have to get out of the vehicle to do this, so it would have to retreat to a safe position from the front line to reload. Just under 300 were built and later upgraded to the M50A1 (these had a new Chrysler V-8, 180hp engine). It’s first engagement was in the evacuation of US citizens in 1965 from the Dominican Republic where it took out the French AMX-13. It went on to prove invaluable during the Vietnam War in the anti-personnel role, firing HEP rounds in defence of US bases. By 1970 it had been withdrawn from service.